Beach scene on 12Ft wall is a quick winter getaway. High quality, heavy duty vinyl should last and please the eye for years. Large pieces stick tightly so take your time. Easy? No but very doable if you have even a little talent. I bought directly from WALLS26 before seeing on Amazon. Quick shipping and great value, do it. 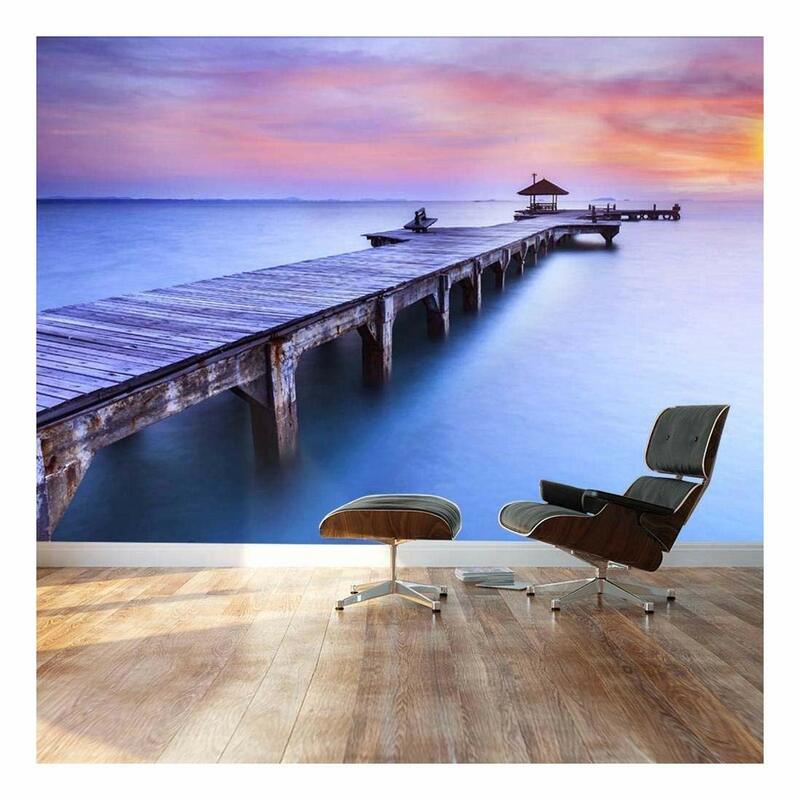 Love these large wall murals. I purchased 3 for my vacation townhouse. I did use the staple gun on the edges and randomly in the middle ... did not affect the look at all. I just want to ensure nothing fall down throughout the years. Here's are the photos. Came out totally awesome. I am going to buy more for my 2nd house. I bought: "Palm trees on tropical beach" Truly beautiful! Hung easily (there is a learning curve) . Had a problem with a crease in other mural when applying, and asked seller for help. Got an email the next day with advise that easily fixed the problem. They get an A+. I ordered murals from a different company first, took 1 look at the poor print quality and returned them. No such problems with all 6 of the Wall26 murals I bought. I put it in my pt waiting room, and everyone walks in & goes "aah!" This wall mural is beautiful..love it. ? This looks small but it isn't. I did it this way because I need the 2 sides to add some family picture. Good quality, though you'll need the patience of Job to get it up and properly aligned. I'm highly skeptical of anyone who says they did this by themselves and had it turn out great, because it took my wife and me about 3 hours to get it up and smoothed properly. I'm sure it also depends on the scenery you choose, but for the mountain/river/forest I purchased, there were lots of areas to align and we were doing so on 8' ceilings. I haven't done the final step of cutting in the middle of the overlap yet, as I need to get a new razor blade to make the cut... if I do at all. You can't really notice the overlap when looking directly at the image, only from viewing on a side angle do I notice it (which for my application probably wouldn't ever happen due to the placement). Overall, for $60 I think this is a great addition to my wall, and we now have the confidence to try a larger application elsewhere in our home. Oh, and for prep work before installing, I lightly sanded the whole wall with 1500 grit and then wiped it down with a damp sponge. Make sure to get all the dust off, and I think the adhesion will be fine. Good luck! Update 3/6/18: I ended up trimming the overlap on one of the panels, and I regret doing so. The line is very visible now, and I much prefer the look of the overlapped sections...it looks a lot more seamless than the area I trimmed. So, my recommendation is not to cut the overlap. Unless there is some super-thin razor blade I'm not aware of, I think it sort of ruined that panel and I would not do it again. Otherwise, I have only notice very minimal peeling at one edge, but after smoothing it back down a few days ago it has not popped off again. The quality is extremely high and the adhesive very durable. My only complaint--and the reason for a 4-star instead of 5--is that there are NO GUIDELINES for where the pieces connect. They don't cleanly match at the seam, but overlap by an odd amount (sometimes 1.25", sometimes 1.5") and it's up to the person installing them to figure out how to line them up. For this pattern, it's not really a big deal (the trees hide a multitude of errors) but for another, more geometric picture that this company offers... it's going to increase the difficulty manifold.